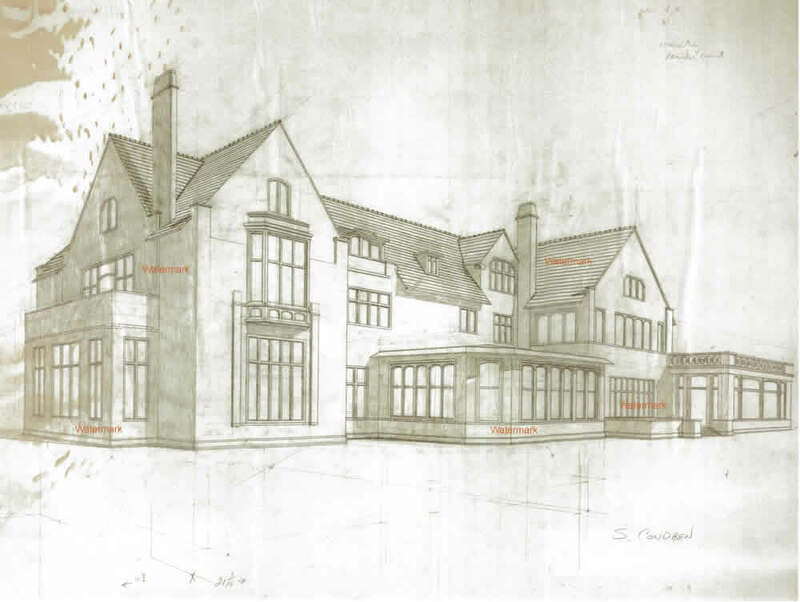 This article is about Loeb mansion blueprints #123Z, which is for sale at discount with prints by artist Stephen F. Condren, BFA-SAIC, of Condren Galleries, a Fine Arts Gallery, offering JPEG & PDF scans. 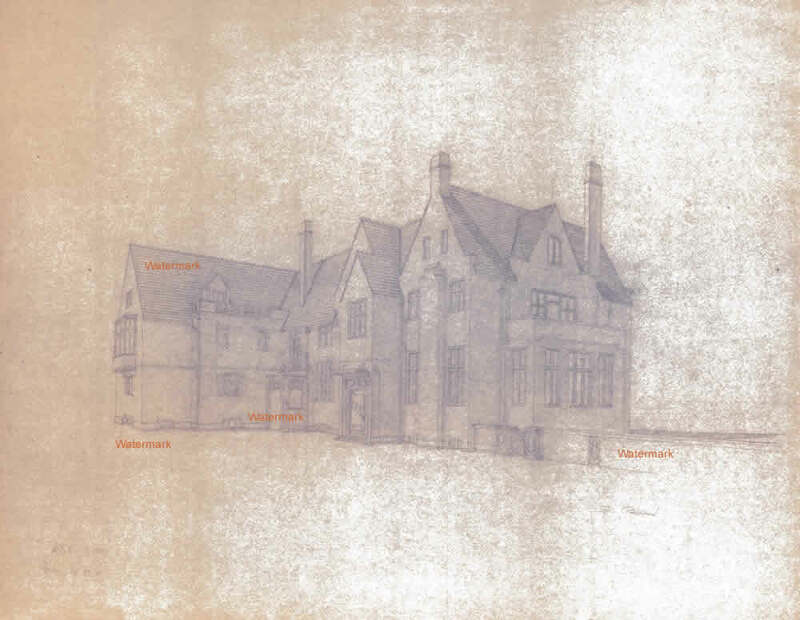 Front Façade blueprint of the Loeb Mansion in Kenwood, Chicago. In 1924 the Crime of the Century was committed by two brilliant students of the University of Chicago, Richard Loeb and Nathan Leopold. Not only were they brilliant, they were from amongst the wealthiest families in the Chicago. They lived in the ultra exclusive neighborhood over Kenwood, just north of Hyde Park in Chicago. This was and still is the mansion district of Hyde Park Township. This famous rendering is now in the permanent collections of the Chicago History Museum. The mansion located at 5017 S. Ellis Avenue, Kenwood, Chicago, was commissioned by Albert and Anna Loeb in 1910. Though the mansion was raised in the summer of 1972, the brick wall and gate posts still remain. Note, the pedestrian post, which was to the left of the remaining post on the right side is missing. What you see in the photo below are the two posts on the left for the car, and the right post of the two pedestrian posts on the right. Photograph of the Albert Loeb mansion at 5017 S. Ellis Avenue, Kenwood, Chicago. The address of the home was 5017 S. Ellis Avenue, Chicago, Illinois, 60615. The style of architecture of the home is Tudor. The mansion sits on at least 6 city blocks, but I am not sure of this. 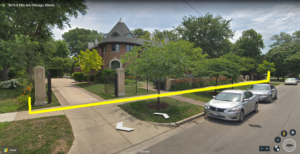 The property size is similar to that of the Julius Rosenwald mansion just one block to the north on the same side of the street but at the corner of Ellis and 48th streets. The house was designed so that the front faced north and the vast garden side faced the south. The entire eastern wing was the Living Room and right above was the Master Suite that took up the same enormous area. As you entered the front door you came into a long narrow marble hall and at the end of the hall there were a few steps up that had a door that open into the entry. The entry was adequate in size but lot large by any means and just to the left was the staircase the had a landing leading up to the second floor. There was an organ built into the base of the staircase. As you turned to your left you entered a vast space which was the Solarium that looked out onto the gardens to the south. Today these two famous renderings hang in the collection of the Chicago History Museum. Collection ID: 2005.0118.1-.3. The line work for this drawing is very light because of the use of fine line mechanical pencils. At this time lead holders or mechanical pencils were the work horse of the drafting industry. There was no AutoCAD or printers. 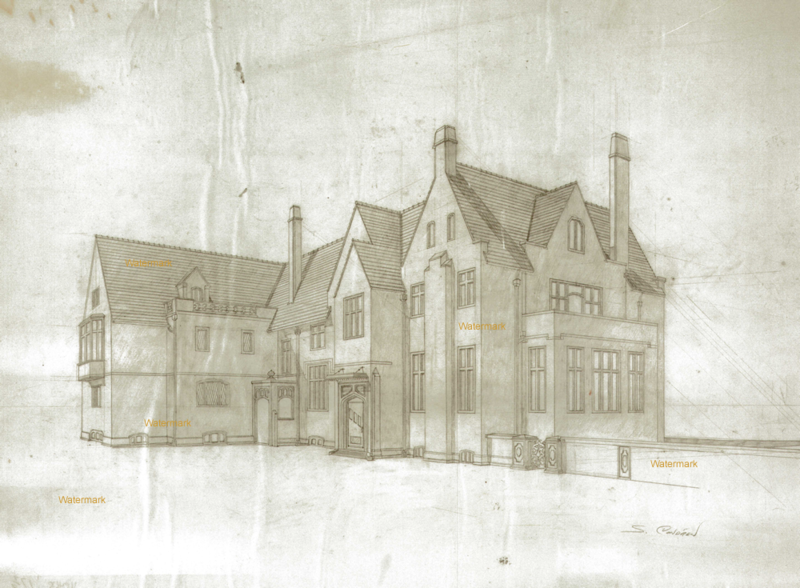 Pencil architectural rendering of the Loeb mansion of the Leopold and Loeb murder case of 1924 in Chicago. 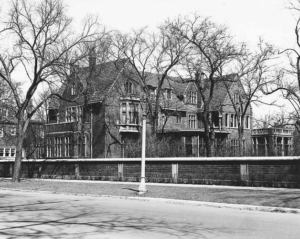 The mansion was at 5017 S. Ellis Avenue in the Kenwood/Hyde Park district of Chicago. This rendering was done by artist Stephen F. Condren for Condren Galleries product #5000A. Architectural rendering in pencil of the garden view facing south of the Loeb mansion. This is the home of Richard Loeb during his murder trial in 1924 in Chicago. The rendering is done by artist Stephen F. Condren for Condren Galleries product #5000A. Blueprint of front entrance of the Loeb mansion in Kenwood/Hyde Park Chicago by artist Stephen F. Condren for product #5001A.